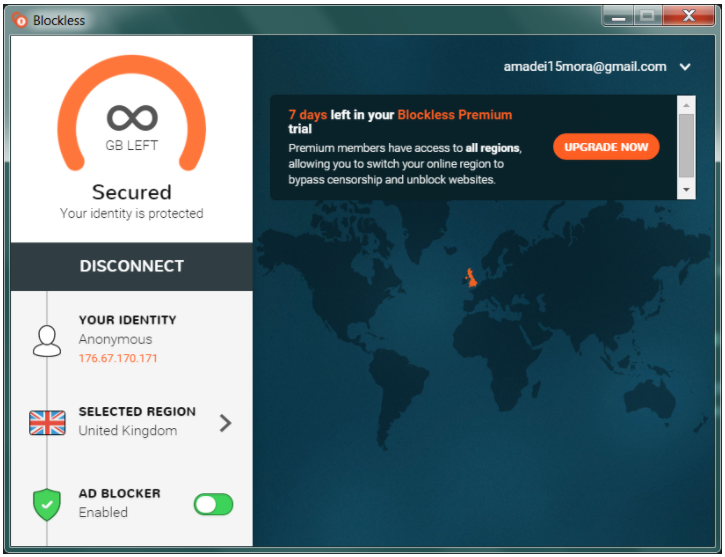 Blockless VPN is a Canadian company that started out as a Smart DNS provider and then expanded to offer the VPN service. With servers in 14 countries, 7-day unlimited free trial, preconfigured servers for torrenting and high-speed connections, and cross-platform software, you’d think Blockless is a godsend. My experience was mixed, at best. Luckily, the provider grants you a 7-day free trial of its premium service without limitations. This means you can test the ins and outs to see if it works for you. And test you must because Blockless VPN isn’t the cheapest kid on the block. Roughly, there are four plans – free, which is limited to one country on one device and comes with a basic ad blocker; monthly - $9.95/mo; semi-annual that kicks in at $53.7; and yearly priced at $89.95. None of these look cheap. The paid plans offer identical features – access to all 14 regions, ultra-fast speeds, up to five connected devices, advanced ad blocker, and streaming SmartDNS. It’s odd – and annoying – that you have to register and hit “upgrade” to access the plans breakdown. Otherwise, you can only see the free and $7.5/mo premium plans on the main page. Also, Blockless offers no refunds, and I found a few negative user reviews online stating the provider is not cooperative in helping folks cancel their subscriptions. 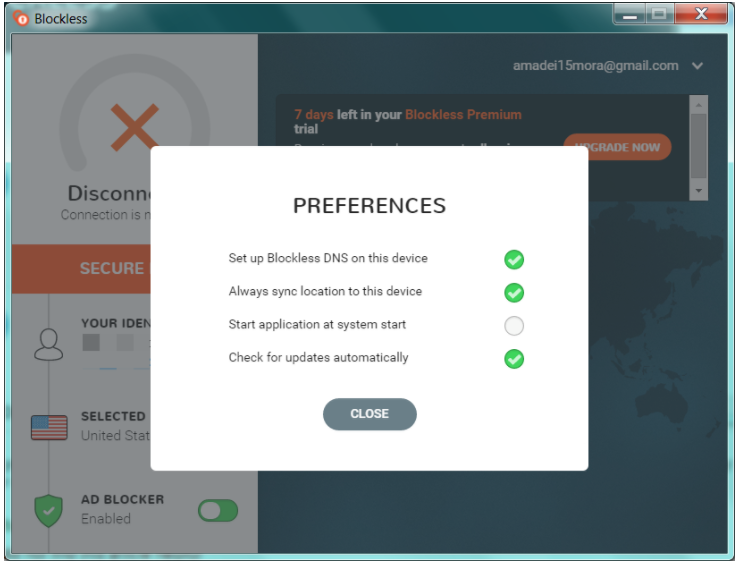 Blockless VPN offers native apps for desktop and mobile devices, but not for Linux. They also have a Chrome extension, and offer extensive guides on how to set up their DNS service on smart TVs. I tried my luck with a Win desktop app and Chrome extension. The first thing that made me cringe was that you log into both apps using your email and pass you created to sign up. Since you can’t use a disposable email at sign up, you are using your email to connect to a VPN at all times, which isn’t my idea of privacy. The desktop app is sleek and dead-simple, with minimum toggles. This is good if you’re a newcomer, but if you’re anything like me and would like to look under the hood – you’re out of options here. By default, Blockless configures your connection with its DNS numbers, and the first thing their prompt support told me to do was to disable that. After about an hour of to-from with Blockless support, I was able to get the desktop app running. I hate to say it, but the performance was painfully inconsistent. For about an hour, I couldn’t connect to the US server. When I tried to measure speeds on other servers, speedtest.net would churn out one error after another. I was hoping to get better results with the Chrome extension, which did connect me to the US server but phased out without warning leaving me unprotected when I thought VPN was running. It was odd that the Chrome extension wouldn’t allow me to change locations until I connected to the default location. 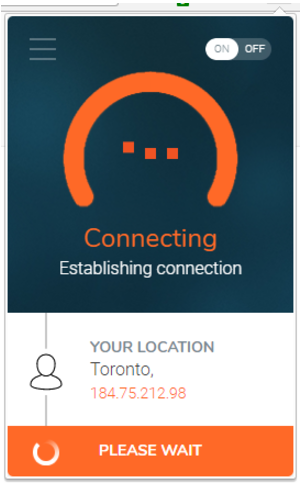 The list of locations is only available when you are connected, which is counter-intuitive if you ask me. Overall, the Blockless performance leaves a lot to desire – long to connect, inconsistent, and not quite transparent. For instance, what does “Always sync location to this device” mean? That said, Blockless support was fast and helpful, but couldn’t explain why my speed tests wouldn’t run other than that my ISP and default speeds were to blame. With a wealth of other VPNs not having this issue on the same hardware, this isn’t a valid justification. The desktop app has the nifty pre-configured connections for torrenting and for ultra-fast speeds. That said, the torrenting pre-set relies on Canada-based servers, which is not the best of locations if copyright regulations are of any significance. Other than that, there is no kill switch, a way to review protocol settings or get any idea what encryption they’re using. It’s all a mystery. As I said, getting the speed test readings was a challenge, but when I could connect the download speeds were decent, and the upload speeds were either decent or non-existent. Blockless didn’t help me bypass Netflix VPN blocks, but I was able to access BBC iPlayer without any hiccups. That is, when I was able to get the app to work. For one, they do collect and store your personal information including the payment details, phone number, email address and can share it with third parties and law enforcement, as required by the Canadian law. It’s not clear if they keep any activity logs, nor what protocol and encryption they use, so if privacy and anonymity is a priority – look elsewhere. I also take it they don’ t own their servers, so an undisclosed number of third parties can potentially have access to your data.